There’s no better way of getting to know people than cooking and eating together. Food helps break down social barriers and combats loneliness, whilst a nutritious diet can be one of the main cornerstones of a healthy lifestyle alongside regular exercise. It’s for these reasons that GCDA (Greenwich Cooperative Development Agency) has been running free weekly Cookery Clubs across Greenwich and Lewisham boroughs for many years now, with the clubs in Greenwich funded by Greenwich Council’s public health team. The aims of the clubs are to increase participants’ awareness of healthy eating and to develop the skills required to prepare meals using affordable, easily accessible ingredients, without the need for a kitchen full of the latest gadgets! GCDA is a not-for-profit organisation that’s been working in the local community for more than 30 years, sharing a passion for sustainable, well-made, nutritious food. Typically, its Cookery Clubs are run in community venues and are open to everyone, regardless of previous ability or experience. You’ll find 60 clubs running across Greenwich borough per year, including in Charlton at Mascalls Meeting Room on Victoria Way, and they run in 5-week blocks, with up to 12 participants taking part each time. In addition, GCDA can also tailor an offer for individual groups and organisations – they’ve previously worked with Age Concern, Pause, Nepalese groups, army families and older residents in social housing and a charity for women who’ve experienced repeated pregnancies that result in children needing to be removed from their care. 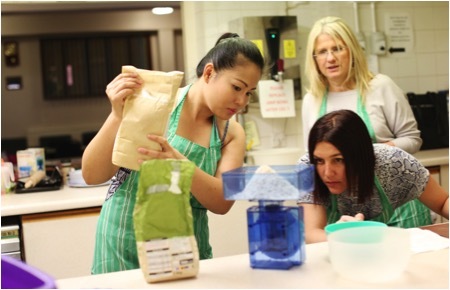 All the tutors at GCDA’s cookery clubs are people from the local community. They’re all DBS checked and have been trained by the Open College Network, so you know that you’re learning from the best. Many started out attending Cookery Clubs themselves and loved the experience so much that they decided to specialise and train as tutors themselves! And as for results? Well they speak for themselves, last year GCDA ran 72 Cookery Clubs and reached a total of 662 people. Nearly half said they’d increased the number of meals they cooked from scratch and when it came to eating more healthily, there were real improvements too: 55% of participants reported an increase in the amount of fruit and veg they eat, 43% had cut down on sugary drinks, 65% measured the oil they used in their food and 42% had started measuring salt when cooking. If you want to book on, call 0800 4704831 or if you’d like to commission a bespoke offering for your organisation please contact christina[at]gcda.org.uk. Previous Article Can you help win cash to restore Rathmore Youth Club’s mosaic benches?